This winter reminds me of Florida winters of long ago. Winter has been kind to us. No significant damage in the garden from freeze or frost. In keeping with Winter's mild temperament and ample sunshine the garden calls for attention during this season. I love the constant quest for placing the right plant in the right place always keeping in mind the specific microclimates within the microclimate that is my garden. These things fuel the creative me. One of the downsides about transitioning my garden into a more naturalistic style is the tendency this style can have to get cluttered. Untidy happens when sections run together without some delineation. It might be caused when branches intermingle excessively or fall over onto one another creating confusion to the eye, or when seedlings drop where they will to impede a walkway or seating arrangement. I don't like messy. That's just me. If you like messy don't hate me. I'm good with your messy. It's just not me. 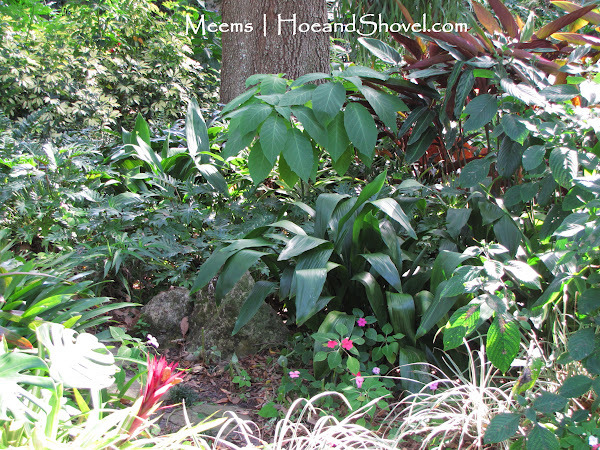 The challenge to mix in Florida-Friendly plants with natives and tropicals in a pleasing arrangement for my eyes AND to also benefit wildlife is both satisfying and inspiring. In any intensely planted areas messy can happen. Which takes us back to right plant, right place. When planning these crowded spaces it's even more important to take into consideration the mature size of the choices we make. 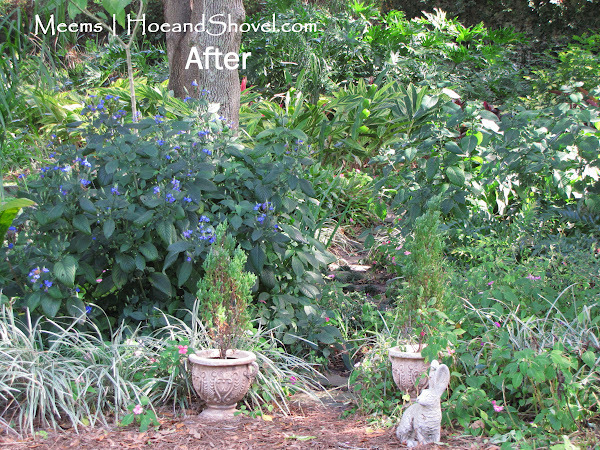 We want to minimize the burden of increased maintenance when the goal is to keep that foresty, tropical-ish, naturalistic look without constant pruning. Occasionally it is necessary to purge these crowded conditions along the narrow places. Otherwise all sight of navigating abilities through the central garden is lost. 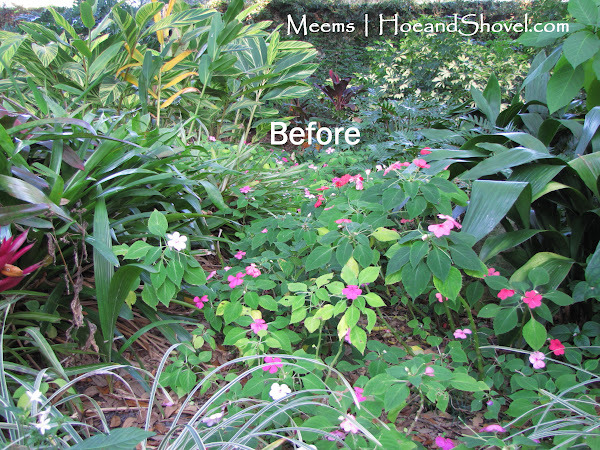 As you can see from the above before and after photos, it was mostly self-sown impatiens impeding the route. 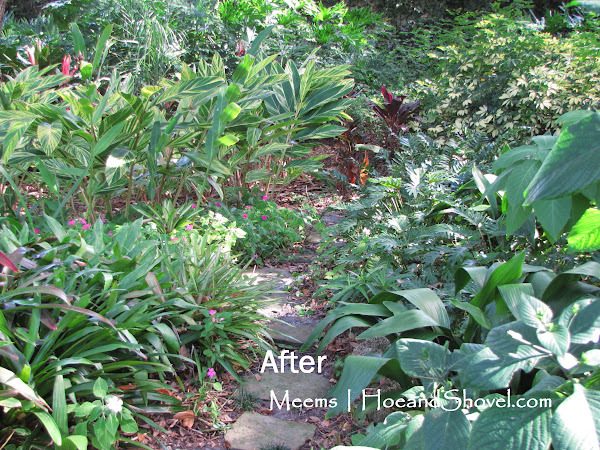 Love seeing the rocks on the side of the pathway now that most of those impatiens were extracted. With all that 'messy' out of the way the mondo grass that is slowly crawling its way around the flagstones is visible. 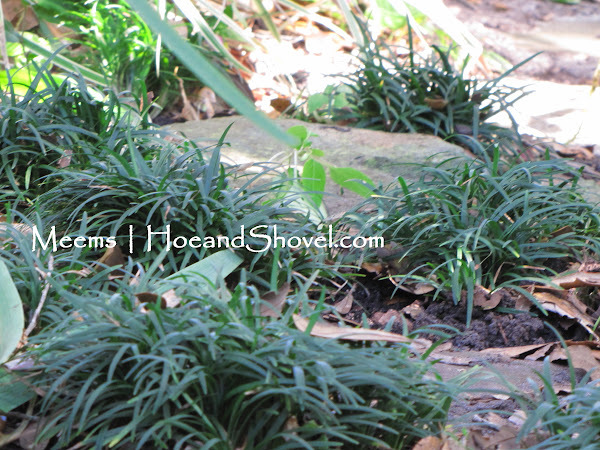 I adore those indestructible tufted mounds of deep green. 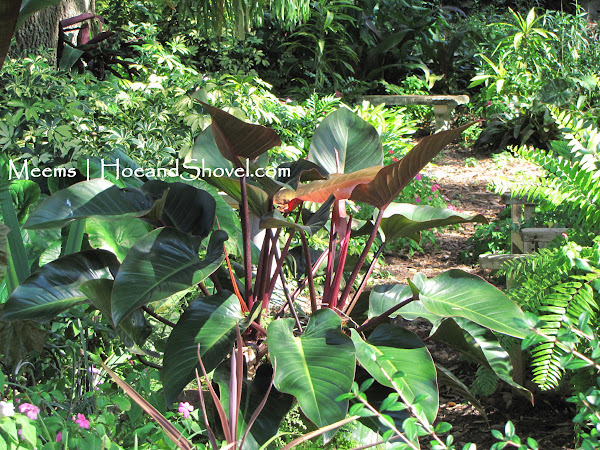 The tropical plants are showing little sign of retreating this winter. I'm happy they are hanging around this winter. Taking a look down the tropical pathway it is difficult to discern that we are in the middle of winter. I'd like to give a big hug to winter for gifting us with so many beautiful days. Fingers are crossed for Florida's winter splendor to remain. I just said to a friend yesterday that this seems a lot like winters used to be here. Just looked at the forecast and 8 out of the next 10 days are in the low 80's. Ah, that is the way winter should be. I did lose a red porterweed (don't know what the real name is), but am hoping it will come back. Had lots of "frosted" leaves on plants....but all minor. Love seeing your before and after pics. When I read your blog I think that I'd better cut back on my work hours so I can get back in the yard. I like the non messy too, garden looks great. I think I'm in a similar zone to you (except upside down). We didn't get any significant frosts at all last Winter. All gardens need a good chop back and tidy up from time to time, I think. It also stops the aggressive growers taking over. 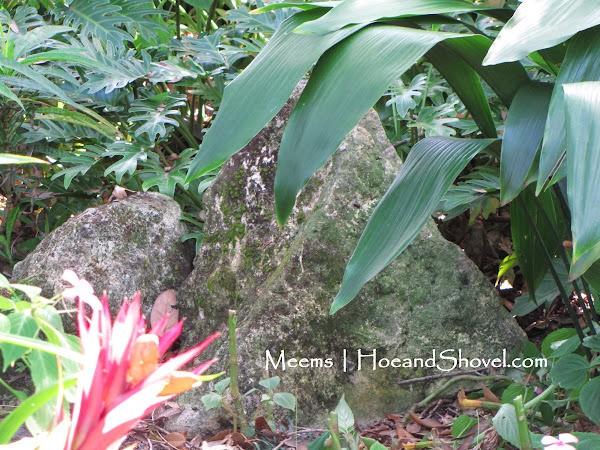 I love the full lush look, but yes, my garden gets the messy look fast. It seems to creep up on me, before I turn around the mess is here. 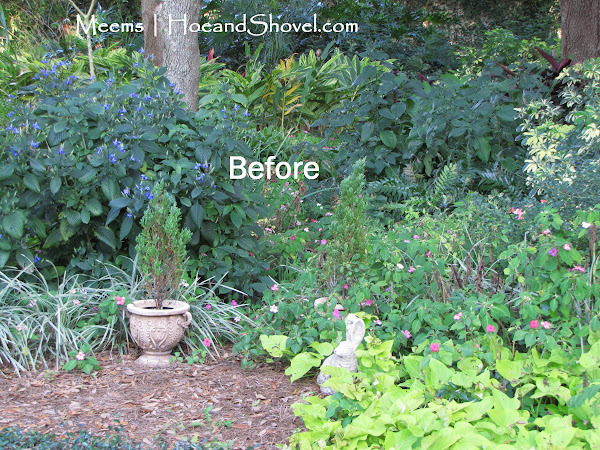 love your before and after shots!! Indeed, it has been a wonderful winter and it is great to see so much green in the garden. Your garden looks great!